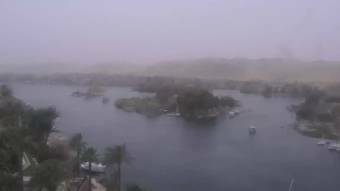 It's 07:00 in Aswan, Egypt right now. View of the River Nile A livestream over the Nile river with the city of Aswan. Soma Bay: Seaview, 202.5 miles away. Soma Bay: Soma Bay Beach, 202.5 miles away. Hurghada: Beach of Hurghada, 226.2 miles away. AIDAprima: Captain's View, 252 miles away. AIDAprima: View from the Port Side, 252 miles away. AIDAprima: View from the Starboard Side, 252 miles away. Sharm el-Sheikh: View of the Red Sea, 274.3 miles away. Dahab: Live from Dahab, 320.8 miles away.